The birds are gone. I guess the Mr’s Mom’s Mr’s right, it only take a few weeks for the chicks to mature. It’s either that or they got eaten. Whatever it is, they are gone. It is kind of nice not having birds trying to attack you walking through the door. I am sure the mail carrier appreciates it as well. I did notice, while they were here, the neighbor’s cat stop coming around. (YAY!) But now I guess he’ll be hanging out outside the house clawing the Japanese maple again. I made Mr got a ladder to take picture of the empty nest. It’s kind of interesting. I don’t see any shells. Mr reckons that the chicks ate the shell. Came home today and saw a package outside the door. Thought it was my Guitar Hero for the DS, but it was not. The Mr was the only brave soul to be able to go out there to retrieve the package. It’s a care package for our trip to Bali in July. It’s got a nice travel kit, maps, hotel guide, and a nice fluffy blanket. This is making the up coming trip seem more and more real! 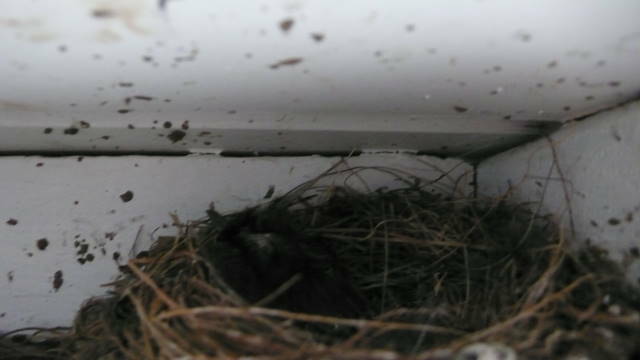 Last week, I blogged about birds nesting by our front door. Since then I have made the Mr to get the mail and use the side door. Every time I try to get the mail, the bird would dive bomb me and make this clicking noise. It’s pretty scary. Well, as I was trying to get the mail today, I saw something in the nest. Note I was not successful in retrieving the mail. I don’t know how our mail carrier does it. He/she is a brave brave soul to be against this beast of a bird. Actually, the baby bird is pretty cute. It is worth not being able to come through the front door. Last weekend, as the Mr phoned home, I asked him to ask Frank about our situation. You see Frank (The Mr’s Mom’s Mr.) is kind of into bird watching. He assured my Mr that if it’s the type of bird that he think it is (a finch) all this will be over in about a few weeks. But then Mr’s Mom’s Mr lives in Ireland so, maybe the birds are different. We shall see. Hopefully Frank’s right and the baby (babies?) will grow up while we are on vacation and stop dive bombing anyone that come nears the door. I can’t believe it’s almost a year since I left Plaxo. Read more about it here. It’s been a fun an interesting year. Met lots of great people and lots of fun stuff happened. Last year around this time, I was also planning a trip to Ireland. This year I am planning a trip to Korea and Bali! I have never been to either, so I am super excited to go. I will post our plans later. It’s going to be so much fun.